It’s not easy being a cat with a jetpack. Paws make it hard to use the controls. 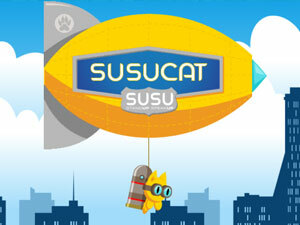 So it’s down to you to help SUSUCAT navigate through the industrial city landscape. Earn points as you go, and try and make it onto the high score board. Have fun! It’s a dangerous world for our intrepid frog. 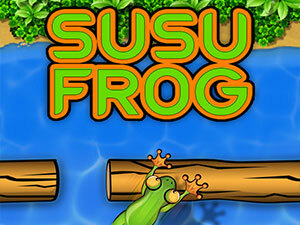 Can you get SUSUFROG across the road without getting run over? Look out for the fly for bonus points! 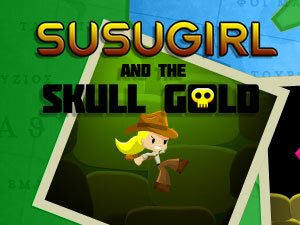 Meet SUSUGIRL, a girl who loves to collect ancient artifacts. SUSUGIRL has to get 8 gold skulls that are in a cave full of traps! And what’s worse, has a gigantic rock that pursues her! Will she escape the cave?